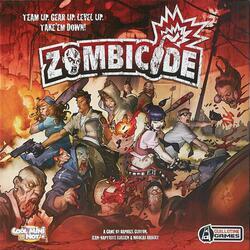 Zombicide is a cooperative game for 1 to 6 players, from 13 years old. A game lasts from 30 minutes (beginner's game) to 4 hours (expert's game). Each player controls one (six-player game) to four (solo game) survivors, humans trapped in a zombie-infested city. In reality, survivors quickly become zombie hunters. However, the team must constantly maintain the balance between survival and massacre because the Level of Danger increases with the intensity of the fighting, and the ranks of the infected are constantly growing. The smallest slip-up can lead to disaster. Zombicide is a fun and easy game with fun miniatures, in a universe inspired by comics. The atmosphere constantly oscillates between "beat'em up" and "survival horror" while the survivors are in turn prey and predators. The zombie hunt seals the union of humour and despair!